Add all ingredients to a mixing cup along with 3/4 cup of crushed or shaved ice. Blend in a stand mixer for 10 seconds and then pour everything into the serving glass. Garnish with a spent lime shell. Alternatively you can shake this drink and strain into a chilled cocktail glass. This is the Hemingway Daiquiri as he drank it at the El Floridita Bar in Havana, Cuba. This drink is also called a Papa Doble if you double the amount of rum (or in our case increase to about 3 1/2 oz). Pitchers of this drink were poured into tall, V-shaped Martini glasses and Hemingway said in the movie that he held the house record drinking 17 in one evening. Note this was all taking place at the Tropicana bar, not El Floridita. The movie left out any reference to sugar or syrup and history tells us that in fact Hemingway preferred no sugar claiming all it would do is make you not want to drink as many and increase the chances of being sick the next day. I need a little additional sweetening - 6 drops of Maraschino as your only sweetener would make a really tart drink. The Bacardi rum that Hemingway used was a different animal than what you will find on at the liquor store today. When Castro took power, Bacardi left Cuba and set up shop in Puerto Rico. Their rums became both hugely popular and a lot less interesting. If you are in a country where you can find it, I would recommend Havana Club Anejo Blanco rum for this drink (this is Cuban rum which is banned in the U.S.). Failing that, Ron Matusalem Platino or Flor de Cana 4 Year Extra Dry work nicely. This is one drink that doesn't benefit from using an aged rum - stick to white rums. 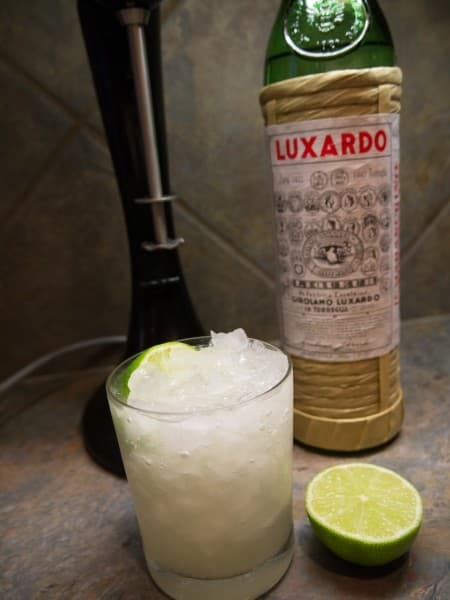 Six or seven years ago my palate was just getting used to the strong flavor of Maraschino, so I was using it half and half with syrup to make my Hemingway Daiquiris. I am more used to this liqueur now so I have made it the sole sweetener in my recipe. If you are still getting used to Maraschino, sub in some gum syrup. The old recipes use the juice of 2 limes. The limes in Cuba are smaller than in the United States. A lime down there is closer in size to a key lime--about the size of a golf ball. If Hemingway specified two of these, then don't use two huge honkers like we have in the United States. You'll have one tart drink. I have standardized the recipe with 3/4 oz of lime juice to make it easier. Hemingway is said to have remarked that if he was just going drinking, he'd have about six of his namesake Daiquiris. If he really wanted to tie one on, he'd have 12 Papa Dobles. The guy didn't mess around. If you order this drink in a good craft cocktail bar, you will often get an up version more reminiscent of an old school Daiquiri cocktail. I call this version a Modern Hemingway Daiquiri. Just make the drink as prescribed in the recipe and strain into a chilled cocktail glass. Asking for a Papa Doble at Peche in Austin, TX resulted in this up version, and it was quite good especially if you are inside so the drink does not warm on you. But generally I prefer this drink the way Hemingway drank his on crushed or shaved ice.